The City of Cape Town’s Recreation and Parks Department has refocused its operations to prioritise mowing and restoring parks around the city. The drought has wreaked havoc on City parks and greenbelts with many now dry and sandy patches. The City has set aside additional resources to restore these spaces. The City remains committed to service delivery. ‘The City of Cape Town’s Recreation and Parks Department is aware of the current state and the backlog in mowing activities at our parks, open spaces and cemeteries which was caused by the recent water crisis,’ said the City’s Mayoral Committee Member for Community Services and Health, Councillor Zahid Badroodien. The department had a tough time balancing the importance of sustaining the beauty of neighbourhoods and parks, while at the same time conserving water. ‘Cape Town is one of the most beautiful cities in the world. We now have the opportunity to reinvigorate our open spaces which were impacted by the drought. Through this project we can remind citizens that we are focused on service delivery in all aspects. 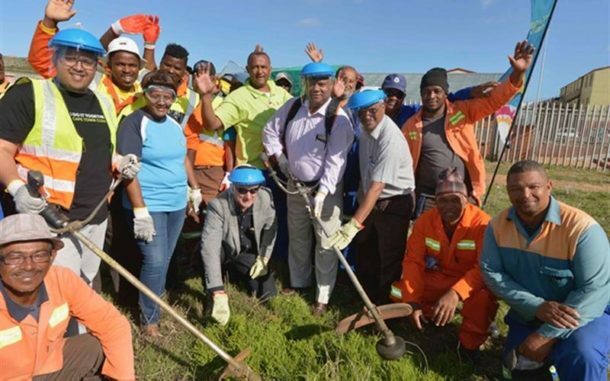 This is a project aligned with our recently launched clean-up campaign to make neighbourhoods neat and tidy,” said Executive Mayor, Alderman Dan Plato. The Recreation and Parks Department manages 3 526 community parks, 12 district parks, 1 996 hectares of road reserves and amenities, 10 biodiversity areas, 364 greenbelts, 40 cemeteries and a nursery. The cleaning and mowing programme starts this week in Ocean View, Northpine and Langa. ‘The grass cutting campaign is part of the wider clean-up campaign that is being rolled out across the metropole. The City has a responsibility to provide efficient and effective service delivery to our residents. This includes neat and tidy public open spaces, many of which are used for recreation purposes,’ said Mayoral Committee Member for Urban Management, Alderman Grant Twigg. ‘As part of the city’s efforts to provide efficient and effective services the Recreation and Parks Department will train 455 EPWP workers. In the first six months they will be equipped with the necessary skills to ensure that they are fully capacitated through on the job mowing training, basic horticultural skills training, tree planting as well as irrigation system repair training,’ added Councillor Badroodien. There are many benefits to having parks in communities. Not only does it improve air quality, but it also provides spaces for children to connect with nature, strengthen communities, beautify neighbourhoods and improve physical and psychological health. City of Cape Town, Media Office.